House of Blues Entertainment, Inked magazine, Crush Entertainment and TKO have joined forces for the inaugural “The Inked Music Tour” featuring THE DAMNED THINGS, it was announced by Kelly Kapp, Vice President, House of Blues Entertainment and Rocky Rakovic, editor of Inked. “We are pumped that the two great, hip and edgy brands of Inked and House of Blues Entertainment were able to bring our devotees under the same roof-especially because it’s the roof of the House of Blues,” said Rakovic. 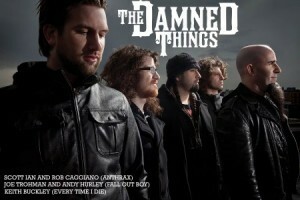 THE DAMNED THINGS is the new band featuring members of FALL OUT BOY (Joe Trohman, Andy Hurley), ANTHRAX (Scott Ian, Rob Caggiano) and EVERY TIME I DIE (Keith Buckley, Josh Newton). “Ironiclast”, the debut album from THE DAMNED THINGS, sold 6,200 copies in the United States in its first week of release. The CD landed at position No. 1 on the Top New Artist Albums (Heatseekers) chart, which lists the best-selling albums by new and developing artists, defined as those who have never appeared in the Top 100 of The Billboard 200. “Ironiclast” was released in North America on December 14, 2010 (one day earlier internationally) via Island/Def Jam. “This marks the first time that Inked and House of Blues have come together and we couldn’t be more psyched about the partnership. House of Blues is the rock star in the live entertainment industry. We are happy to play Keith Richards to their Mick Jagger,” he concluded. “We’ve Got A Situation Here”, the first video from THE DAMNED THINGS, was written and directed by Brendon Small, the co-creator of Adult Swim’s “Metalocalypse”.